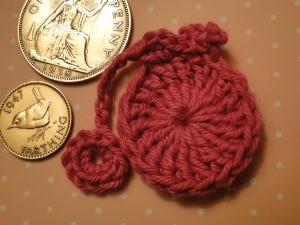 This version is crocheted in sports weight cotton with a 3 mm hook and is 2 inches/4.5 cm wide. 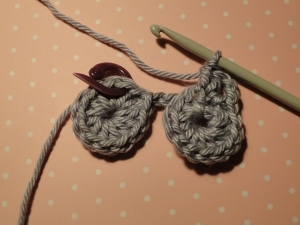 I use two stitch markers in this pattern so that you know exactly where to crochet. Starting with a magic ring, ch 2. Work 12 hdc into ring. Slip stitch into top of 1st hdc. 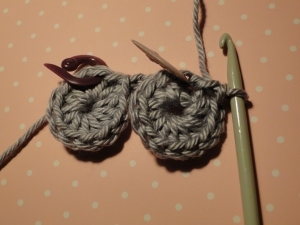 Put a stitch marker into the top two loops of the next stitch so you can easily see where to join in later. Ch 9, ss into 5th chain from hook to make a ring. Ch 2. Putting a stitch marker into the top two loops of your first hdc, make 12 hdc into ring. Join with a sc into the space between your ch 2 and first hdc. Hold the two wheels so that both right sides are facing. Work 1 hdc and 5 sc around the chain between the two wheels. Do not work into the chain, just around it. 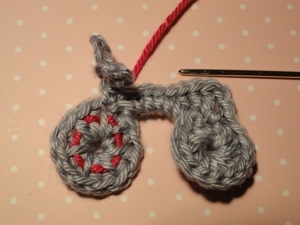 Then work 1 sc into the top of the front wheel where your stitch marker is. Second handlebar: ch 4, ss into fourth chain from hook. Ss into the bottom of the five chain you made - the final ss. Weave around the front "spokes" of the wheels in a contrasting color to add a nice touch - pix below! Work 12 htr into ring. Slip stitch into top of 1st htr. 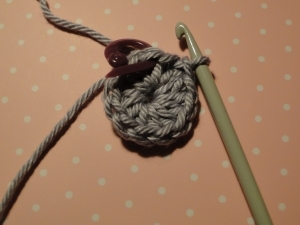 Put a stitch marker into the top two loops of the next stitch so you can easily see where to join in later. Join with a dc into the space between your ch 2 and first htr. Hold the two wheels so that both right sides are facing. Work 1 htr and 5 dc around the chain between the two wheels. Do not work into the chain, just around it. 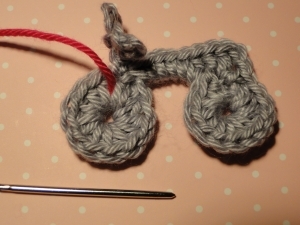 Then work 1 dc into the top of the front wheel where your stitch marker is. 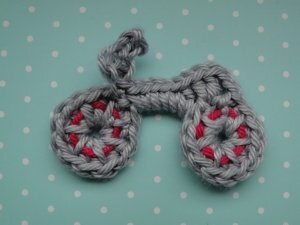 The Crochet Bike Applique: some pictures to show you how it's made! Not the detailed pattern here, but with enough info I hope to show you what's supposed to be happening as you go along. The stitch marker goes into the top two loops of the next stitch so that you can join in easily when you come back here later! 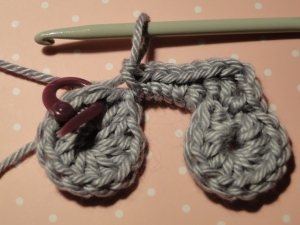 Now we work into those top two loops where your stitch marker was. 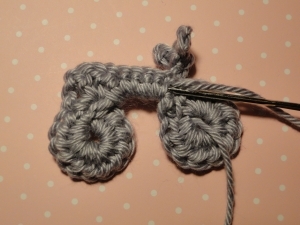 Ch 2 and crochet 1 dc (UK tr) and 1 hdc (UK htr) into those top two loops. The crossbar is great fun! Hold the two wheels so that their right sides are facing towards you. Then work another hdc (UK htr) around the chain that joins the wheels together and snuggle it in neatly just behind the back wheel. Then continue, working 5 sc (UK dc) around the length of the chain. 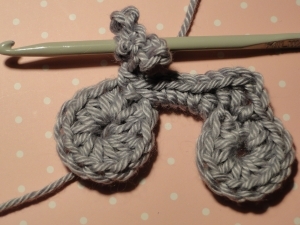 Join with a sc (UK dc) into the top two loops of the stitch where you placed a stitch marker. Work the handlebars, one with five chain, the other with four, then join with a ss into the bottom of the five chain handlebar. Your bike is ready to ride! But... one more thing! Two, actually. You have to weave your ends in neatly, and, if you like, add a little customization. The finished article - almost! If you want a kind of "3D" effect, with the handlebars perpendicular to the crossbar: hold your bike so that the right side is facing you. Then weave the handlebar yarn end down to the right of the handlebars and through to the back, pulling the handlebars round into position. 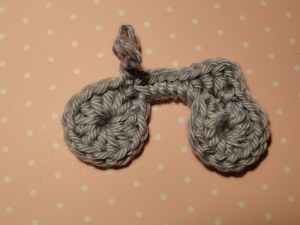 If you want flat handlebars: weave your handlebar yarn end down through to the left of the handlebars then through to the back. Then weave your end through the back of the stitches running along the back of the crossbar, and weave the end in from your front wheel - I run it around the back of the inner stitches of the ring. 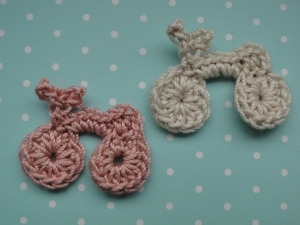 Two bikes crocheted in cotton thread with handlebars laying (fairly) flat! Use a contrasting yarn to weave around the wheel spokes - which are, of course, the front legs of your half double crochets, or half trebles for us UK-ers. Working on the wrong side of the piece, I thread my second color around the back of the front wheel. 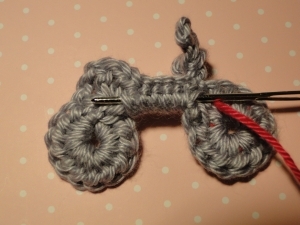 Then, working on the wrong side again, guide your yarn along the back of the crossbar to the back wheel. 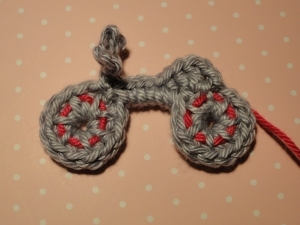 Then bring your yarn out to the front and work around the back wheel. Pop your yarn back to the wrong side and weave in the end! 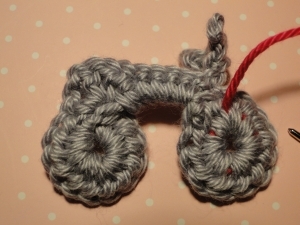 I do hope you enjoyed crocheting this fun little bike. It gave me an idea for a related applique. So, as you do, I just went with the flow. The result? And I'm so glad I had a real English penny and farthing to go with my design. I did spruce them up for my photo, although I do understand that valuable old coins should never be polished.